Hello, beautiful! Happy Monday! If you were following along on Friday waiting for your weekly dose of Fashology you probably are already aware that we had some technically difficulties. To start the new week we are back up & running ready to grab life by the beans! Today I want to share with you my new favorite skincare line, CLN&DRTY ! The owner, Paula Hoss is a compete & total boss babe. She is a mompreneur raising her two adorable girls with her husband, Paula is an all around inspiration. Her & I actually met through our church. 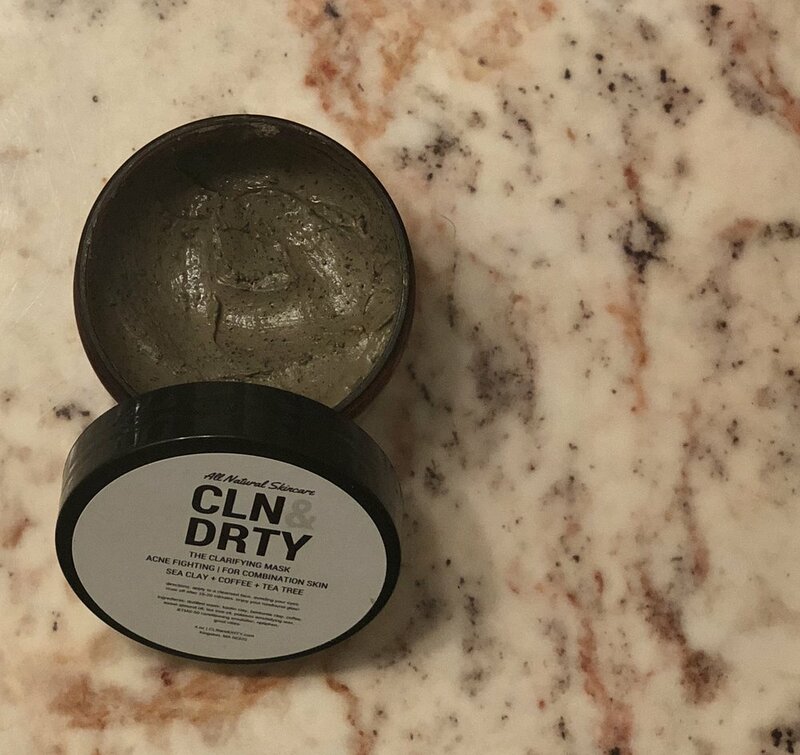 CLN&DRTY is an all natural skincare line offering items from deodorant, face masks, makeup remover, & so much more! Paula generously gifted me with an orange lavender deodorant, clarifying mask, glow mask, charcoal scrub, & luxury anti-aging cream. I went live on instagram last week we'll applying one of the masks, I mentioned that although I was gifted these products I have been posting nonstop (past our brand/influencer agreement) because I love these products that much. All opinions are my own girlfriend, I wouldn't steer you to a product I didn't believe in. Now that we cleared the air let's break down my skin. I have had dry skin my entire life. I typically have leaned towards cheap drugstore brands full of fillers which weren't helping my skin. Honest, I did a photo-shoot once & a makeup artist straight up called me out for it. That is when I begun a personal movement to start taking better care of my skin. I had been eyeing CLN & DRTY for quite some time. We shall now proceed to the portion of this post were I will breakdown each product for you. Summer Solstice Lavender & Orange Deodorant! Okay I'm going to share something a little personal with you, I have very sweaty pits. More recently with this whole blogging thing I have decided there is no shame in my game, I'm going to be 100% with you even if that includes going to IG live to put this stuff on my pits (which I real life did). I have tried all sorts of deodorants the medicated stuff, the spray kind, etc but I settled for BAN you know the green packaging. I kid you not the first time I put on this all natural stick my pits were dry ALL DAY LONG! Highly recommended! The Glow Mask! This includes turmeric & carrot to brighten your complexion. This mask works so well even my husband noticed with the first use. When I initially opened this I was a little taken back by the color & texture probably because I didn't know what to expect. I put this on at night for 15-20 minutes, washed it off, & applied some anti-aging cream before I went to bed. The next day my skin had a visable natural glow! The Clarifying Mask! This is to fight acne featuring sea clay, coffee, & tea tree. It smells amazing. I'm a sucker for a good mask. The clarifying mask is perfect for regular use to help keep the skin clear. This mask I applied also for 15-20 minutes, rinsed off, & applied the luxury anti-aging cream. The charcoal scrub to your left is made up of charcoal, clay, & tea tree also with acne fighting powers. I would suggest using the clarifying mask 2 times a week & the other days I would recommend this scrub. Like any scrub its gets sudsy cleansing your pretty face. Lastly the luxury anti-aging cream. I like putting this on before I go to bed after any mask or scrub. When using this a dab will do ya! Well lovely I hope you enjoyed this post! Don't forget to use our code for 20% OFF at CLN&DRTY, 20FASHOLOGY at check out. Today 8.9.18. we are doing a giveaway for a $50 gift card to CLN&DRTY so check it out HERE ! Till next time!